A transparent volume boost for in front of your amp or overdrive. Good, clean boost sound. Input/output options. 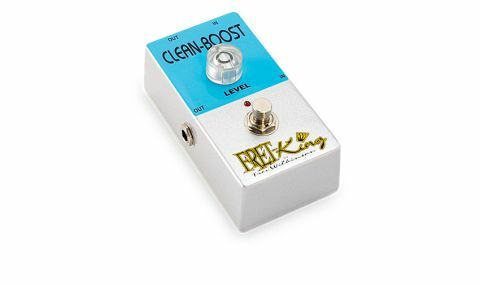 The Clean Boost is the more polite member of the Fret-King boost family (the other being the recently reviewed Power Boost), with the same power but none of the harshness. An innovative and very welcome feature built into all Fret-King pedals (apart from the wah) is duplicated inputs and outputs so that you can connect from the sides or from the top, giving you an extra option in positioning them on a crowded 'board and minimising cable runs. "This Clean Boost is a classic example of a 'one louder' pedal"
They're mix and match, too, so it's possible to have, say, a side input and a front exit and also to send the signal to two different amps, two effects chains or just use the spare output for your tuner. This Clean Boost is a classic example of a 'one louder' pedal, designed to ramp up your volume when you need it without colouring your tone in any way. With the same 20dB of oomph as the Power Boost, you can dial in just the right amount of extra volume that you might need for emphasis in a song without adding any unwanted distortion from the pedal.